All parishes in Malta normally had a crypt (populary known as Kennerja – Charnel House) built beneath the parish church in which most of the parishioners would be buried, except those who had a family tomb in an open air cemetery. There are 3 charnel houses in the Cathedral, two of which are privately owned. Following changes in government regulations related to hygiene and health burials in charnel houses was suspended. The Mdina Metropolitan Cathedral’s main charnel house can be accessed through concealed stairs located in the Chapel of St Luke. The crypt is opened to the general public in November, the month dedicated to souls in purgatory, to allow them to visit and pay respect to their relatives buried beneath the Cathedral. The Mdina Cathedral’s main charnel house is made up of four sections . The first and largest area is reserved for the burial of parishioners, whilst another area is reserved for the clergy. In the farthest end of the charnel house is a chapel reserved for the burial of several Bishops. Within this Chapel one can find two beautiful stone sarcophagi. 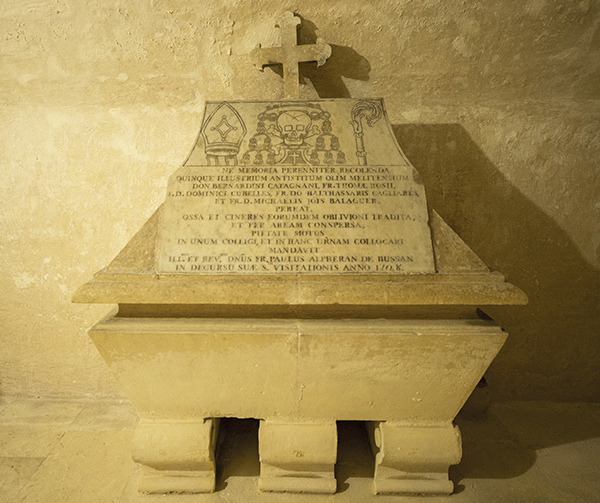 One belongs to the French Bishop Paul Alphéran de Bussan who died on 20 April 1757 at his Mdina residence. He was buried in the Cathedral crypt but his heart was interred in the chapel of the seminary he had built. On the initiative of the Cathedral Chapter, a memorial baroque marble slab was installed in the Chapel of the Blessed Sacrament of the Cathedral. 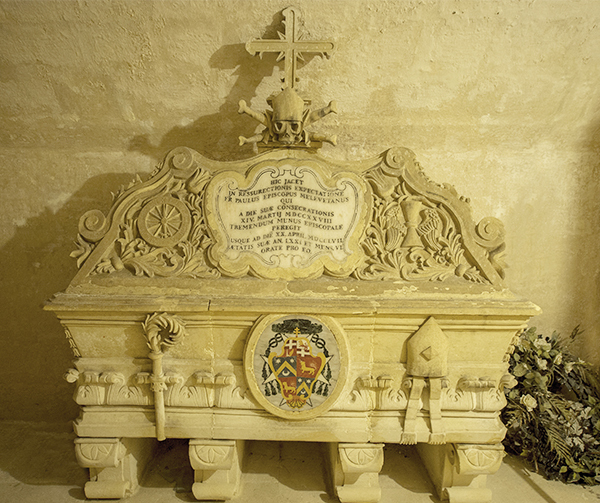 The other sarcophagus contains the remains of five bishops who had been buried in the old cathedral, prior to the Mdina earthquake. Once the new Cathedral was built, their remains were moved to the new charnel house and stored in this second sarcophagus. The last part of the crypt is the Ossuary which is a room in which the human bones and remains from cleared up tombs are kept. This process was needed to clear tombs to make space for new burials. Bishop – Paul Alphéran de Bussan, 1728 – 1757. On March 8, 1728, Pope Benedict XIII appointed Paul Alphéran de Bussan as Bishop of Malta. He was consecrated by the same Pope on March 14 of the same year. In 1733 Bishop Alphéran de Bussan built the Mdina seminary, now the Cathedral Museum.